As night falls in the world’s largest refugee camp in the world, Rohingya women and adolescent girls begin to sneak out into the darkness and rain. They walk long distances on muddy paths to go to the latrine and wash up. With limited security, no flashlights and unlockable shelters, these nightly journeys leave many like them vulnerable. A majority of the refugees in the makeshift camps are women and children, and they are often the ones that suffer the most. In many cultures, including the Rohingya, women cook and manage the home, confining themselves indoors during the day and venturing out only at night. But inside Cox’s Bazar, where “homes” are made of bamboo poles covered by plastic sheets crammed together on precariously steep hillsides, many women are no longer able to care for their households. Cooking inside the shelters can be hazardous and, if firewood is unavailable, many resort to burning rubbish, creating toxic fumes. Finding livelihood opportunities outside the home is even harder, as the local host community is very poor and many Rohingya women have no work experience and limited financial literacy or education. A mother and her child receive fortified biscuits at Kutupalong, the largest refugee camp in the world. It’s just one of many pressing challenges facing Rohingya refugees one year after the start of the refugee crisis. In August 2017, a sudden influx of hundreds of thousands of Rohingya from the Rakhine State in Myanmar began crossing into Bangladesh. They were escaping violence at the hands of the military in their home country, a place where Rohingya have been historically marginalized. Rakhine villages were burned down, leaving people with nothing and nowhere to go. Children frequently arrived in Bangladesh alone and starving, many having witnessed their parents being killed prior to crossing the border. 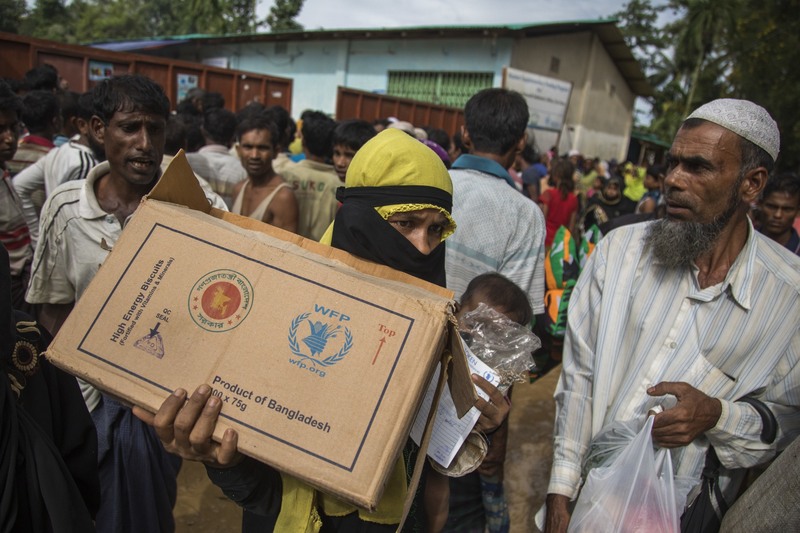 The World Food Programme (WFP) quickly mounted an emergency response and began setting up food distribution sites, working with other U.N. agencies, NGOs and the Government of Bangladesh to help meet the immediate needs of more than 850,000 refugees. Over time, WFP and its partners also implemented a school meals program that now reaches more than 320,000 students with micronutrient biscuits. School meals and other safety nets for children will continue to expand to mitigate the harm on children’s physical, social and cognitive development as well as to reduce the incidence of child marriage for young girls. The humanitarian agency is also working with the government to enhance its emergency preparedness and response. WFP and partners are addressing numerous challenges facing women and girls in the camps. Given low literacy rates among the women and girls, WFP has developed pictorial banners to convey information and uses female outreach workers to share messaging. Distribution sites offer separate lines for men and women, as well as private toilets and breastfeeding corners. Women are designated as the main entitlement holder for e-cards within WFP’s information database, allowing them to decide when to visit stores full of fresh fruits and vegetables and to buy the amount of food they can carry. WFP also operates onsite help desks so that women can share their concerns given they do not often have mobile phones to reach the hotline service. 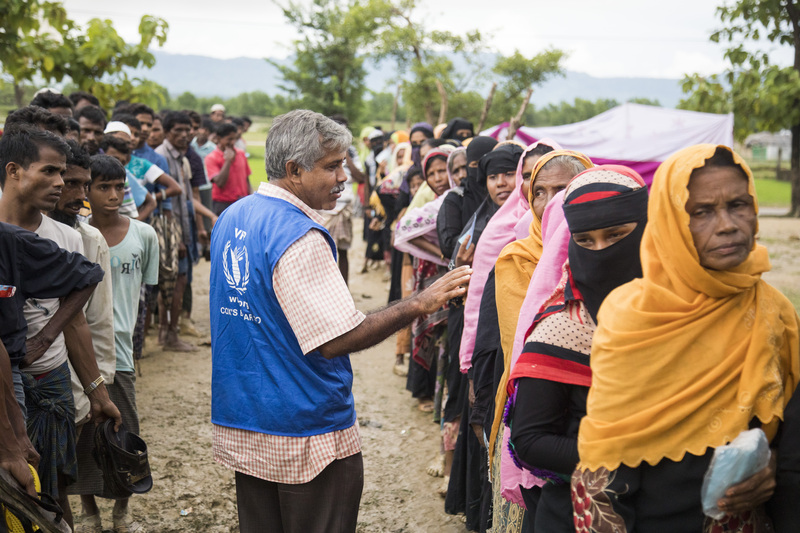 Approximately 920,000 refugees and several hundred humanitarian staff are now living in Cox’s Bazar during the annual monsoon season. In advance of the increase in torrential rain, the United Nations along with its international and local partners ramped up logistics and engineering plans to reduce the threat of landslides on the hilly terrain. Refugees themselves helped build bridges to increase access to markets, stabilized slopes and constructed toilets. Unfortunately, due to funding shortfalls, landslides have washed away many shelters and resulted in the deaths of dozens of refugees. While over 30,000 refugees have been relocated to safer locations, nearly 250,000 refugees are estimated to still be at risk of landslides or floods. 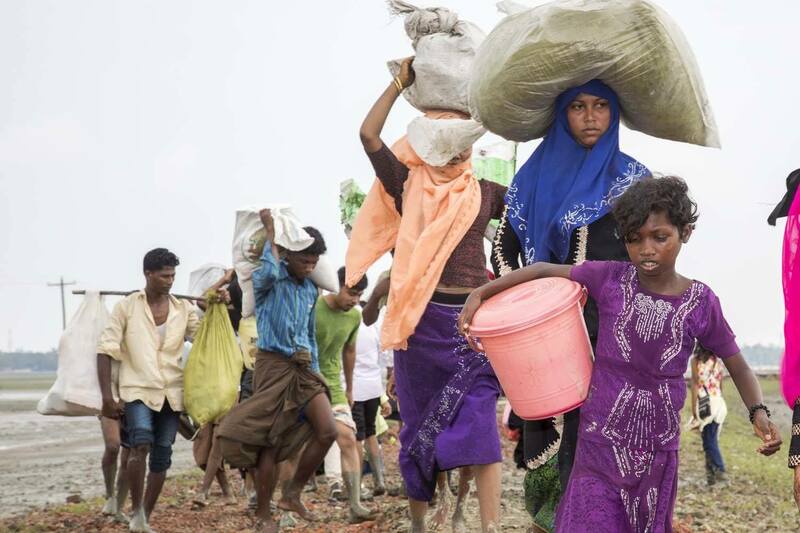 Navigating these threats—be it dangers of everyday life in the camps or extreme weather—is now a daily reality for the refugees in Cox’s Bazar, all of whom have no other home and fear relocating back to Myanmar. WFP is working to create jobs and enhance livelihoods within both host communities and among the refugee population, including agricultural development and training in literacy as well as life-skills and income-generating activities to help improve the quality of life for both women and men. Despite the difficulties, one young mother reflects on her experience with optimism. 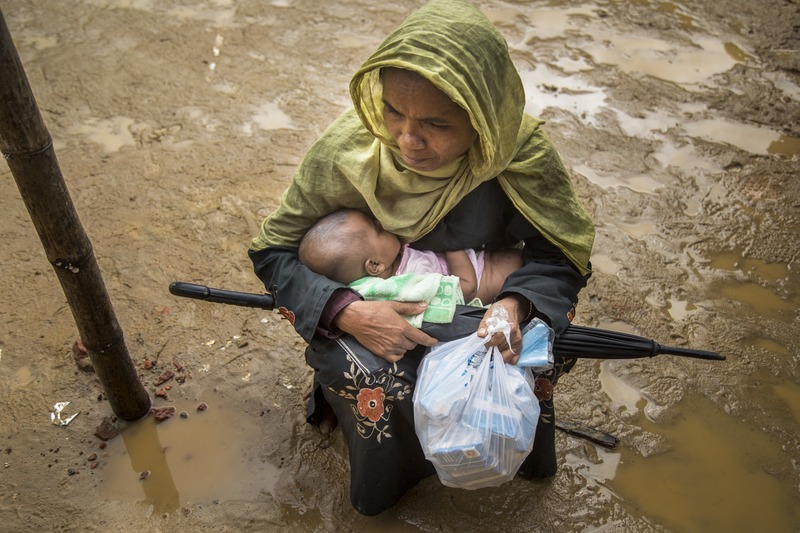 “As we were running from death, Bangladesh provided a sanctuary…my hope is to have enough to provide for my baby—to clothe, feed and educate him,” she says. Globally, the average length of refugee displacement now stands at 17 years. In Cox’s Bazar, this may be only the beginning.